Application Programming Interface | Computers and Structures, Inc. Build custom solutions on top of the CSI Platform to automate your workflows and increase your efficiency. Have you used the CSI Application Programming Interface to create a plugin or a standalone product? Tell us about it here. 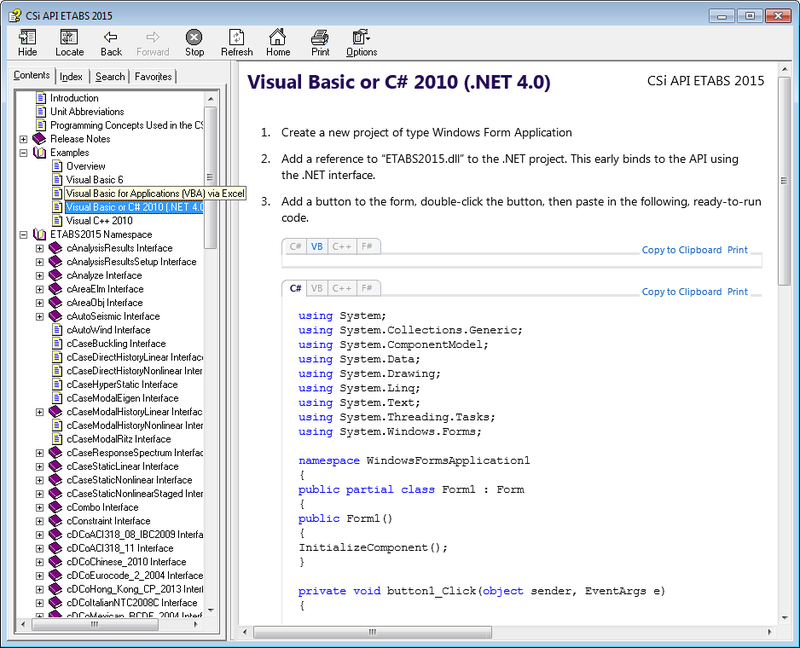 Computers and Structures, Inc.’s Application Programming Interface (API) allows engineers and developers to programmatically exploit the power and productivity of CSI software. With a little programming knowledge it is possible to create a spreadsheet, plugin, or third-party application that can interface with CSI software. The API is compatible with most major programming languages, including Visual Basic for Applications (VBA), VB.NET, C#, C++, Visual Fortan, Python, and Matlab. Whether a seasoned developer or new to programming, you should find the CSI API syntax easy and intuitive. The API is compatible with most major programming languages, including Visual Basic for Applications (VBA), VB.NET, C#, C++, Visual Fortran, Python, and Matlab. Employ the API from within an Excel spreadsheet to create, modify and run a model, then extract the results back to the spreadsheet for further processing. Plugins created with the API can be directly accessed from within CSI software, allowing users to utilize custom commands in conjunction with the regular software features. Tekla Structures built bi-directional links with CSI Products using the API. Third-party developers, such as CAD and 3D modeling developers, can use the API to enable their software with all of the sophisticated analysis and design technology of CSI software. Developers can create rich and tight two-way links with CSI software, allowing for accurate transfer of models, complete control of execution, and extraction of analysis and design information, all from within their application. The CSI API offers direct, fast and efficient access to all of the advanced numerical methods of CSI software. It allows direct two-way transfer of information without intermediate files, providing fast throughput for large models. Use of the CSI API by third-party developers all but guarantees that their applications will remain compatible with future releases of CSI software, a nontrivial concern to both developer and user. Engineers can use the CSI API to create their own company tools that automate and/or integrate with CSI software. These tools can automate repetitive tasks thereby increasing user efficiency and eliminating user errors. If you already have other in-house tools, whether they be spreadsheets or full blown applications, you can use the CSI API to connect these tools to CSI software. For commonly used structural components, use the API to build and interface to parametrically build such components. Automate and configure specialized loading requirements that your firm commonly needs to apply to structures. Build customized algorithms that implement specific design checks. The CSI API is currently available for SAP2000, and ETABS. To get the most out of your development efforts the CSI API has been made as consistent as possible between the products to allow tools and applications created using the CSI API to be easily adapted for all CSI products. All of the API functions are thoroughly documented in a searchable help file. This help file contains information on hundreds of CSI API functions, with the discussion for each function describing the syntax and parameters, what version the function was first made available, any changes to the function, and an example showing the usage of the function.